Useful free PC diagnostic tools / utilities - PC Buyer Beware! There are several very useful free diagnostic and information and monitoring tools that are either provided as part of Windows XP/Vista/7/8.1/10 or by third-party developers. The following list of free tools can provide useful or very useful information about PC components, such as if the display and sound device drivers have passed Microsoft’s Hardware Quality Labs tests (dxdiag), test RAM memory, stress-test the graphics card’s GPU, monitor temperatures, fan speeds, voltages, etc. 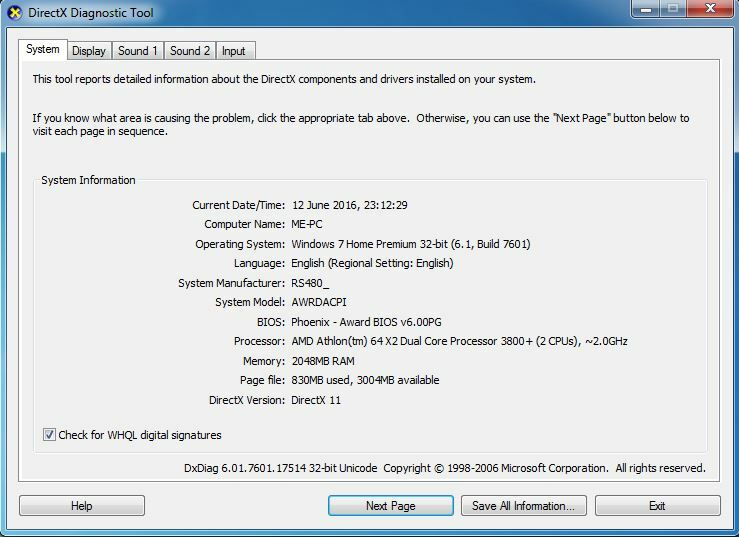 The Windows DirectX Diagnostic Tool is the diagnostic tool for graphics and sound that is provided by DirectX, which is developed by Microsoft and is installed on every computer running a version of Windows – XP/Vista/7/8.1/10. You can discover the version of DirectX that is installed by running it. To open it, press the Windows key (the one with a flag on it) and the R key and enter dxdiag in the Run box that is presented. 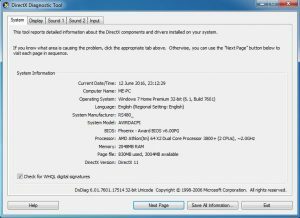 Note that the control panel for discrete AMD and Nvidia graphics cards – accessed from the Windows Control Panel – provides a graphics-card diagnostic program other than the Control Panel => Display item that controls the display settings. The DirectX Diagnostic Tool’s window in Windows XP had many more options and tabs than later versions of Windows, but is the same in Windows Vista/7/8.1/10, as shown below. Click on the image to view its full size. The version in Windows XP provides tests that are run for the display and sound – Test DirectDraw, Test Direct3D, Test DirectSound, Test DirectMusic, which were dropped in later versions of Windows. By default the option “Check for WHQL digital signatures” tells the user if there are any installed drivers that have not been passed by Windows Hardware Quality Labs testing. Untested graphics and sound drivers can be a source of problems. The current version only informs the user that there are no problems or that there problems with the display and sound and input devices such as the keyboard and mouse. No tests can be performed. I have never had any problems when I have used this tool, so I don’t know how it reports problems. The Windows Memory Diagnostics Tool performs tests on the RAM memory of the computer it is used on. Faulty memory causes all kinds of peculiar problems that are difficult to diagnose, such as files that become corrupted. “Processor name and number, codename, process, package, cache levels. “Memory type, size, timings, and module specifications (SPD).